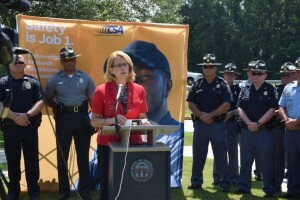 At a press event Tuesday, June 17, the Georgia Department of Public Safety, Motor Carrier Compliance Division, will be convening a gathering to announce stepped-up enforcement efforts to ensure safe operating procedures along I-95 through Georgia. This enhanced effort will affect commercial vehicles travelling in that corridor. GMOA, representing motor coach operators carrying passengers throughout our state and nation, wholeheartedly supports this multistate effort! 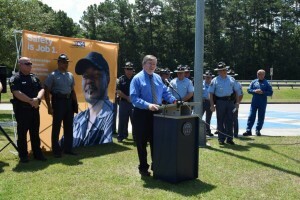 The Georgia Department is working in the corridor as part of a partnership with the Federal Motor Carrier Safety Administration (FMCSA), Florida Highway Patrol, South Carolina Department of Public Safety, and the North Carolina Department of Public Safety. The enhanced effort will be a short term project to increase awareness of safety issues among trucking, motorcoach and public transit vehicles operating in the I-95 corridor. In short, those carriers of people and goods through the State of Georgia. Before chartering motorcoach transportation or when using motorcoaches in commuting within or outside Georgia, GMOA recommends using the following link to the Federal Motor Carrier Safety Administration’s web site, which will enable travelers to access the latest information on Georgia motorcoach companies: http://www.fmcsa.dot.gov/safety-security/PCS/Consumers.aspx. Travelers should use this information to make an informed decision on which company to use – and don’t just use price as the only standard for your decision! Ensuring that motorcoach operators are licensed to do business in Georgia can be done by using the GA Department of Public Safety’s weblink: http://www.gamccd.net/LPCBusCarriers.aspx. On Tuesday, June 17, at the I-95 public rest area just inside Georgia at the Georgia-South Carolina state boundary, the Georgia Department of Public Safety (DPS), in joint partnership with the Georgia department’s counterparts from North Carolina, South Carolina, and Florida, announced an enhanced safety compliance and public awareness effort over their multi-state area. Colonel Mark McDonough, Commissioner of Georgia DPS hosted the event, and the Georgia Motorcoach Operators Association was present and had opportunity to speak in support of the multi-state program effort. John Keys, GMOA Government Affairs; Jim Lucas (Old Savannah Tours), GMOA Board member; and Don Adams (Kelly Tours, Savannah), GMOA Immediate Past-President represented the association with Keys making remarks. The targeted area of stepped-up enforcement and safety education is a short-term effort funded in part through funding from the Federal Motor Carrier Safety Administration (FMCSA) in the I-95 Corridor through those states and affects motor carriers of goods and people in this high-risk corridor. “This is unfortunately a high incidence-rate corridor that we want to make safer and increase awareness of the public of our efforts and their need to drive safely,” commented Col. McDonough. Present at the event were Anne Ferro , FMCSA Administrator and southeast regional representatives from local law enforcement communities. Weighing in with South Carolina’s visible support was Col. Leroy Taylor, Deputy Director of South Carolina Department of Public Safety; Harris Blackwood, Director, Georgia Governor Nathan Deal’s Office of Highway Safety; and Bill Hitchens, Georgia House of Representatives. Keys also contacted the Coastal Georgia Regional Commission, a multi-county public transit provider about the June 17 event, given its operations in the I-95 Corridor, and scheduled a meeting June 16, the day prior to the kickoff event. At the Commission’s offices in Darien GA, two of the region’s GMOA operators met with key transportation staff members and discussed provision of transit service, and how GMOA operator members might be involved in this service. As a result of that meeting, GMOA was invited to participate as advisory committee members to the Commission as it deliberates on transit service, and how private sector participation might be further enhanced. Overall, it was two good days for Georgia Motorcoach Operators Association and its members throughout Georgia! Effective July 1, 2014, the Unified Carrier Registration (UCR) (for Interstate motor carriers) and the Georgia Intrastate Motor Carrier (GIMC) Registration (UCR-GA for intrastate carriers) Programs are moving from the Georgia Department of Revenue (DOR) to the Georgia Department of Public Safety (DPS). DPS is currently in the process of creating a new trucking portal website for customers to register and pay fees for both of these highway safety programs. This website will be operational by July 1, 2014, and all registrations and renewals for both programs will be handled through the DPS Portal. In the interim, please visit our websites, www.gamccd.net and www.dps.ga.gov, frequently for updates regarding the UCR and GIMC transition. Booking a Trip? – Choose Your Operator Carefully! GMOA members are concerned about their passengers’ safety and urge customers to review the safety information included in the FMCSA publication found here before you book your trip. You will find important questions to ask and tips on choosing who you hire to do your group’s trip or to take a personal trip using a motorcoach. Consumers need to remember that the lowest bid may not be all that you should look for in hiring a bus company to ensure a safe, comfortable trip! Make sure they’re safe operators before you contract with them. The Georgia Motor Carrier Compliance Division (MCCD) of the GA Department of Public Safety (DPS) has oversight over trucks and buses to ensure safe operation within this state. See their website BEFORE you book a trip to make sure your would-be operator is licensed to do business in Georgia (i.e., has adequate insurance and a good safety record). Consumers also should check federal safety records which give detailed information on interstate motor coach operators. This is found at the website below. Click on the vehicle type for your trip, then enter “Georgia” and you can search all Georgia operators and get detailed safety information on them. GMOA will alert travelers on adverse weather conditions on this website when the State of Georgia notifies us of them. They will be posted in this space. Travelers should also stay tuned to local media or the State of Georgia website for information during extreme weather conditions. Generally, however, commercial vehicles (motorcoaches and trucks) need to be aware that in winter weather alert conditions, chains or other acceptable traction device (which includes snow tires) must be in place on commercial vehicles. Also, trucks traveling inside the Atlanta Perimeter (I-285) must have business within that circumferential highway, and cannot be “through-traffic” – which is a law in the State.